We are looking for some amazing, innovative, like minded, purpose driven agents to take their business to the next level. NextHome Choice Realty has the perfect systems and tools for you to utilize to bring you on a journey from GOOD to GREAT. Our culture reflects who we are, the kind of agent we attract, and how the client feels about the real estate process. We strive to constantly provide our agents cutting edge technology, client-centric marketing, automated systems, transaction management and an streamlined approach to ensure success. Our comprehensive proprietary platform puts the latest technology at the agents’ fingertips. The process is simplified for you as our agent with a single log-in, multi-faceted approach to training and support, and comprehensive transaction management to allow you to maximize your volume and profits. Our all-inclusive business model is affordable, sustainable, flexible and profitable for you as an agent. We will provide you what you need to take your business to the next level. A native South African, Jules moved to the United States as a teen and lived in North Carolina for over a decade. After marrying her husband, Andrew, the couple moved to a small town near Dublin, Ireland. In 2009, the couple made the move back to North Carolina, where she decided to follow her passion of working in real estate, and in 2016, opened NextHome Choice Realty. Kings’ vision for this progressive, boutique firm is to grow a team of like minded, purpose driven agents, to widen their own horizons by getting the support they need to get ahead. NextHome Choice Realty offers the tools for this success. With the brand, the technology and their forward thinking she believes it will bring a unique culture to our industry. Our office is located in the Town of Cornelius. We offer a professional, well-appointed office space to work from. Our office consists of a conference room, reception area with a cafe style meeting place on the main floor and agent work station and break room upstairs. We do not charge desk fees or require mandatory floor time. 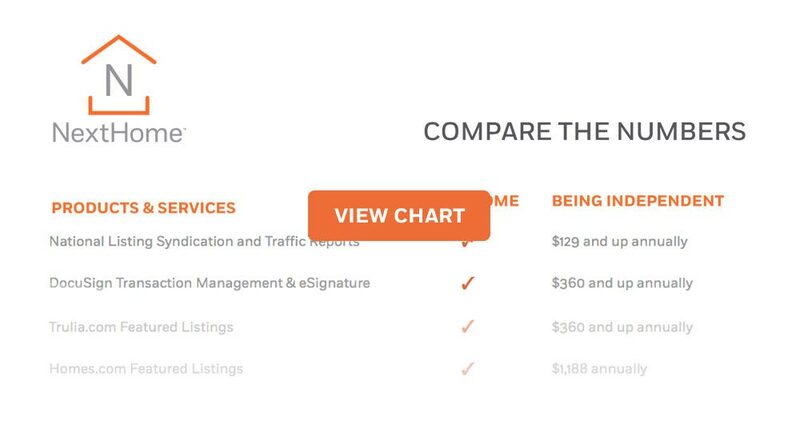 Our better commission splits, with caps, along with superior computer systems, lower royalty and service fees, vendor selections, and other services are all designed to substantially drive down the costs for agents to pursue their careers. Our Agent Fee Structure is as simple as you can get. We offer a low monthly flat rate fee and a net commission income fee. There are no surprises. No extra corporate fees, period. Just your Broker/Agent split remains with cap. Don’t worry about expensive development cost to get your own app. We have you covered with your own customized GPS activated app that your clients will want to use. Search by School and commute time to work and schools. Augmented reality feature. Everything you need in a search app at your clients fingertips. Work from home or the office. You choose! Aside from referrals, in many cases, buyers and sellers find their prospective agents online. That is where you should be to greet them. Our programs assure your strong presence online. We can always give you floor time if you want it though! We provide you with the very best signage for ALL of your listings, you just provide the Agent Name Rider that goes on top with your contact info. We even provide the cute “Luke”, the French bulldog, signs to capture more attention than ever. Go to your next listing presentation with personalized CMA material bound in a NextHome branded book or optimized for your tablet with a wow factor like no other. Knowledge is power and essential to your success. Stay ahead of new technologies, consumer trends, transactional shifts and more through progressive products and training provided by NextHome. The majority of leads are generated through your CRM and campaigns straight from your Marketing, so these leads are free and exclusively yours. As a brokerage we rotate Zillow leads as they come in through the premier agent concierge program. We are about providing quality leads, not quantity or time-consuming leads. You work hard and deserve to be recognized for it! We celebrate what you do to help people build dreams, memories, and families, and we celebrate your success with our National Annual Awards Banquet in connection with our NextHome Annual Conference. At NextHome Choice Realty, fees are kept low. There are no desk fees, no broker review fees, no website fees, no technology fee. The franchise fee is flexible and is charged at a low, flat per-month charge or on a per transaction basis. You can change the way the fee is paid every six months. Why change plans you ask? One common reason is seasonal. During the slower winter season, our agents can choose the percentage option. Then when the spring market arrives, agents can switch to the flat rate option. And for our brand new agents, the percentage option allows them to build their businesses without the monthly fee until they sell their first home. Awesome Branding, Professional Marketing with a Boutique Feel, and Most Important to Myself, a Huge Toolbox of Resources, Training, Agent Connectivity, and Agent Reinforcement. I would like to Encourage other Agents to reach out to Julia King at NextHome Choice Realty. You will not be disappointed with the Fresh, and Energetic Marketing Approach that the NextHome Brand has to offer. Love everything about NextHome Choice Realty. The branding, the colors, the innovative technology, the 24/7 online support and training and the simplicity of doing business. Anything I need is a click away. Any questions or problems it’s a simple phone call away to our member services team. They are speedy to resolve issues and help in anyway the can. The signs are high quality and look classy and are consumer friendly. I LOVE Luke the french Bulldog mascot who guards all our listings and helps brand our company. Made with in Cornelius, NC. Each office is independently owned and operated. Servicing Charlotte, NC.